How Do I Wash Cloth Diaper Covers? 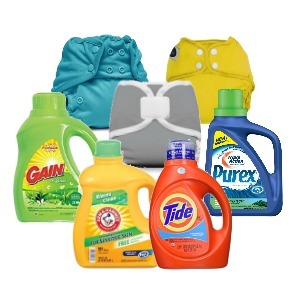 Once you determine what detergent you should use to wash your cloth diapers and diaper covers, you will need to know a bit more about your cloth diaper cover fabric to determine how to best wash your cloth diaper cover. Diaper covers come in many different materials making washing seem a bit complicated, but it's not. Wool and cotton covers require special attention, but the rest of the diaper covers are not especially complex to wash or dry. Diaper covers can be reused a few times before washing. If a small spot needs cleaning, a quick handwashing and hang drying can keep the cover in circulation longer. After three or four days, however, the diaper covers do need to be washed. The largest concern in washing diaper covers is to protect the waterproofing of the covers. Certain things can seriously damage this water resistance and should be avoided. For example, avoid using bleach, fabric softeners, and whiteners as they will break down the protective layers in the covers during washing and reduce the resistance.. Also, soaking the covers can reduce the waterproofing. Once your cloth diaper covers are ready to wash, throw them into the machine. Many covers can be washed along with your cloth diapers. Fasten any Velcro tabs closed to protect the tabs from lint buildup and rinse any soiled spots before washing. To dry the diaper covers, use the lowest cycle on the dryer or consider hanging the covers to air dry. Air drying prolongs the life of the covers. If you do choose to dry the diaper covers in the dryer, be sure to remove the cover after only fifteen to twenty minutes. Wool is a special material that offers its own water resistance. The lanolin found naturally in wool diaper covers helps protect against wetness and also self cleans the diaper cover. For this reason, it is important to reapply lanolin to the covers periodically. Wool diaper covers do not need to be washed immediately after becoming wet. The covers are naturally anti-microbial and self cleaning to a degree. With air drying, the covers are ready to use again. Once the cover is soiled, however, it must be hand cleaned. Handwash the wool diaper covers in lukewarm water using special wool cleaner such as Eucalan. Once the cover is in the water with the cleaner, allow it to soak for ten or fifteen minutes. After this time, gently remove excess water from the cover, but avoid wringing or twisting. Roll the cover between two towels if you are having trouble removing the water. Lay the cover flat to air-dry. Properly caring for wool diaper covers is a bit more time intensive, but the natural fibers and breathability factor can't be beat for those parents who seek the more organic/all-natural route in cloth diapering their babies. The detergent you should use when caring for your cloth diaper covers is directly related to the type of cover you are using on your baby. We carry a variety of cloth diaper covers, please contact us if you need assistance choosing the right cloth diaper cover for your baby.